If you like the LC 358 but not sure on the size, you are in luck. Pride Mobility offers the LC 358 in 6 sizes and it has weight capacities of 375, 500, 600 lbs. It's a great fit for someone under 5'3 and up to 6'2. This is Pride Mobility's most popular lift chair. It's a single motor chair with an easy to use remote for a reasonable price. The Original. The PR 501 is the best seller by far for Golden Technologies. Whether you’re 5’0″ to 6’8″ and 300 to 375 lbs., the Comforter Series from Golden Technologies has just your size — actually five sizes. Featuring a plush seamed backrest with lumbar support, a soft, comfortable seat and our “grip rite” arm design, the Comforter series gives you the perfect fit. This chair comes in Jr Petite, SM, MED,LG, and TALL. 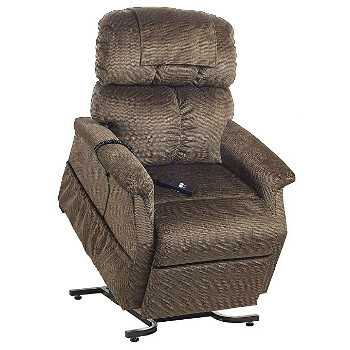 You will searching a long time to find a chair that has 4 motors and is under $1200 but Pride Mobility has done it with the PLR 935 Traquil Vivalift Power Recliner. You get an independent motor for your feet, backrest, power lumbar, and Power Headrest. You also get an easy to use remote with a USB port to charge your gadgets along with lithium battery back up. The PR401-SME is the small/medium for people 5’1” to 5’6” and the PR401-MLA is the medium/large for people 5’7” to 6’4”. This is a single motor chair with a contemporary design with a deep seated seated comfort with ultra soft back. 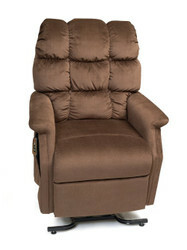 If price is an issue then the PR 355 Monarch is the lift chair for you. With its over stuffed double seamed back the PR 355 feel great. It comes in a Medium & Large and fits someone between 5'4-6'2 along with a 375 lb weight capacity. 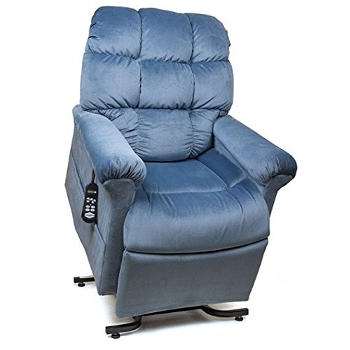 It offer a single motor with an easy remote for lift & recline. You are limited to fabrics on this chair.This chair retails under $900.00. This has been one of Golden Technologies most popular chairs for years. The PR 505 Lift chair is a two motor chair which gives you the ability to basically sit anyway you want because one of the motors actually controls the back independently. It comes in 4 different sizes and is offered in multiple fabrics. The Maxi Comforter features a plush, seamed backrest with lumbar support, a soft, comfortable seat and our unique “grip rite” arm design. You have the ability to go to a zero gravity position which is great for lumbar issues. The difference between this and the PR 501 is that the PR 505 has two motors. The LC 525i has been upgraded and you will like it even more. It's a great chair that comes in 3 different sizes(Medium, Large & petite Wide) to fit someone between 5'4 to 6'2 and is also made in a petite wide for someone a little larger in the hips and 5'3 or under. 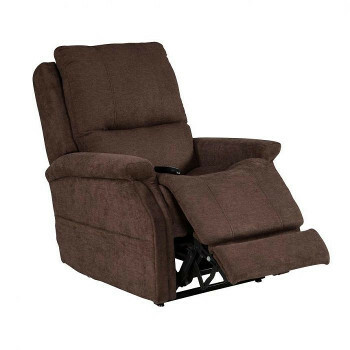 This is a 2 motor chair which gives you the ability to find that perfect position to just relax. You also get a wide variety of fabric selections in this chair too. 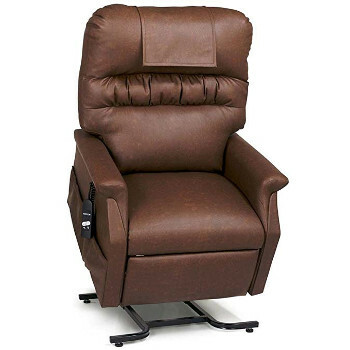 Pride Mobility has really outdone themselves this time with the PLR 985 Atlas Viva Lift Recliner. You get 4 motors in 1 chair! That's right 4 motors in one chair. One for the back, one for the headrest, one for the Power Lumbar, and one for the feet. The chair fits well for people between 5'6-6'2. It has a 375 lb weight capacity with a 22 inch seat width. You also get a easy to use remote with a USB port that gives you the ability to charge your phone or tablet along with built in easy to use CUP HOLDERS!!! Last but not least you get a Lithium Battery back up so you never have to worry about power outages. The PR 510 Cloud is by far my favorite lift chair. I don't think there is another chair on the market like it. The over stuffed biscuit back design really makes you feel like you are laying on air. the unique arms conform in to give you a great feel. They are now making the cloud in a sm/med and med/large and I really like the small/ medium (I'm 5'8 ). You have a 2 motors which give you the ability to lay in trendelenburg or zero gravity or just sit back and relax in the TV Watching position. My favorite color is the coffee bean brisa but you have a lot of options when it comes to fabrics on this lift chair.